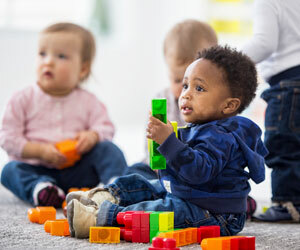 Spatial reasoning measured in infancy predicts how children do at math at four years of age, according to findings from a longitudinal study published in Psychological Science, a journal of the Association for Psychological Science. Emory graduate student Jillian Lauer is co-author of the study. In their analyses, the researchers accounted for the children’s general cognitive abilities, including measures such as vocabulary, working memory, short-term spatial memory, and processing speed. The researchers showed the babies a series of paired video streams. Both streams presented a series of two matching shapes, similar to Tetris tile pieces, that changed orientation in each presentation. In one of the video streams, the two shapes in every third presentation rotated to become mirror images. In the other video stream, the shapes only appeared in non-mirror orientations. Eye tracking technology recorded which video stream the infants looked at, and for how long. Eye-tracking data showed that, as a group, the infants looked significantly longer at the video stream with mirror images, but there were individual differences in the amount of time they looked at it.